Each year one of the closely watched government activities is the Annual Budget released in the first quarter of a calendar year. It is an exercise which impacts everyone irrespective of the walk of life they represent. As per our Constitution, while the government has the mandate to execute the requirements of various laws and day-to-day administration of the country, their finances are put in hands of the legislature. The government is required to have their income and expenditure, including the means to reach the aimed goals for these numbers, vetted by the Parliament. Various articles and sections within the constitution make this entire process mandatory. All government expenses are incurred from the Consolidated Fund of India which can only be done with the permission of the Parliament as per Article 114. This is done through the Appropriations Bill. Article 265 requires the government to have the authority of law to collect any taxes or statutory fees. This is where the Finance Bill plays its roles and provides the required power to the executive and allows it to levy new taxes, modify the existing tax structure or continue the existing tax structure beyond the period approved by Parliament earlier. Article 112 requires the union government to lay an annual financial statement of estimated receipts and expenditure before both Houses of Parliament. Hence, the government needs to bring to the Parliament for approval each year, their proposed budget for the upcoming financial year. The Union Budget defines the nation's financial projections by the Union minister for finance for the forthcoming financial year and a financial review of the current fiscal year. Parliament finally decides on the Budget. So who is responsible for getting this entire exercise accomplished? The finance ministry, under the finance minister, is in charge of overall budget preparations. The ministry has a special budget division which acts as the nodal cell for coordinating with various stakeholders within and outside of the government and is responsible for timely completion of activities to bring out the budget. With thirteen cells/teams within the division, it is involved in all activities related to approval of budgetary allocations, excess demands of funds by states or managing debts/loans of the Government of India. However, while this division has the primary coordination role, there are many other departments and personnel which get involved through the entire process. Though many may only be responsible for providing their expense estimates, some have a more extensive role in bringing out the budget. Department of Expenditure (to account for planned expenses), Department of Revenue (to plan for tax revenues) and Department of Economic Affairs (to plan for non-tax revenues) deserve special mention in terms of critical actors in the budget process. Niti Aayog (erstwhile Planning Commission) also plays an important role by providing critical inputs based on country’s planned development targets within specific areas like infrastructure, agriculture, manufacturing etc. Process Initiation – How it all begins? 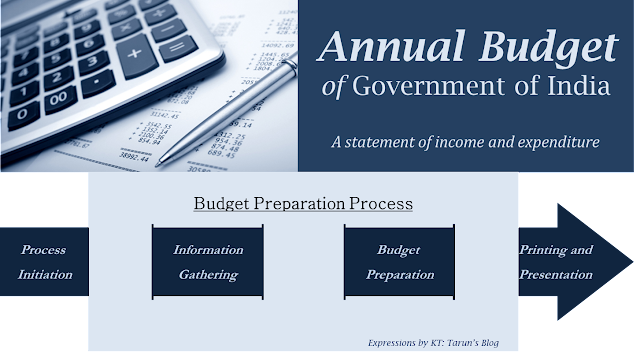 The process for budget formation starts in August-September each year depending on time estimations required for deliberations. The budget division issues a budget circular to kick-off the activities for the budget. The circular contains detailed instructions for various stakeholders (including the ministries, departments, PSUs, and states/UTs) for providing relevant inputs for budget preparations along with specific forms/templates for a statement of estimates, reporting timelines and other constraints. This circular marks the start of 6 months of hectic activities within the Finance Ministry and other concerned entities to race towards the final budget. Information and Sense collection – What all inputs go into the process? At the onset of the budget preparation process, finance ministry officials meet with the Niti Aayog and other planning entities to extensively discuss the potential size of gross budgetary support that would be provided for the annual plan of next financial year. The primary driver for such decisions is the approved funds based on the five-year plan development targets. The availability of funds with the finance ministry and various other political and economic considerations also weigh into these discussions. It is at these meetings that the planned allowable deficits for the budget are also discussed. These initial meetings set out the outer contours of the budget by setting out overall size of the budget and broad directions for the economy to focus on. It is within these boundaries that the finance minister and his team move ahead to plan funding of the Government of India and support for the states. Once initial contours are prepared and the activities are kick-started, the finance ministry begins discussions with various stakeholders across the spectrum of financial and economic activities. As budget has far-reaching impacts on the economy as a whole, it is critical to get inputs from various sections of the society to understand their needs and aspirations. Officials initiate such discussions with various groups including industry leaders from various sectors, economic experts from various education and research institutes and lobby groups like labor unions, industry groups and sector specific representatives. Apart from all these stakeholders, political parties provide another source of inputs. They act as representative of their constituency and electorate and put up their demands to the ministry. While all parties would provide inputs, the ruling party and their allies get a much closer ear of the ministry, as one would obviously expect. The importance of these meetings is evident from the fact that the finance minister himself sits in some of these discussions. These discussions yield specific inputs to the minister regarding expectations of various sections of the society and their recommendations on budget proposals. Each Government of India ministry and department along with States, Union Territories, autonomous units prepare their planned expenditure proposals based on continuing programs/schemes and new initiatives that each entity wishes to introduce. In addition, the entities have to budget for non-plan expenditure which comprises of interest payments, subsidies, and administrative expenditure. Financial advisors and officials from all ministries hold consultations with Niti Aayog and finance ministry to discuss various proposal items and required budgetary funds for them. Post these discussions, each of the entity submits final proposals on planned and non-planed expenditure to the Secretary of Expenditure in finance ministry who consolidates such proposal to come up with overall numbers of fund requirements from the annual budget. Along with planning the expenses, it is equally important to understand the source of which these would be funded. While the expenditures are being collated and documented, concurrently the revenue earning ministries provide details of the revenue receipts from the current fiscal year and the estimated revenue from next financial year to the finance ministry. By the end of the calendar year, the preliminary estimate of expenditure from all the ministries is finalized. As January kicks in, the focus is on to finalize the revenue estimates to steer the expenditure discussions within right perspective. The revenues for the government come in two forms – capital and current receipts. Capital receipts include the payment received by the government against the repayment of loans given or from the disinvestment of government assets and public sector equity. Current receipts include mainly, tax revenues, receipts by way of dividends from public sector units and interest payments on loans given out by the central government. The amounts to be received by way of tax revenues is estimated on the basis of existing rates of taxation and taking into consideration the likely growth and inflation rate over the ensuing fiscal year. On the capital receipts side, estimation of targeted amounts to be realized through divestment of public sector equity and amounts to be realized by way of repayments of loans is made. All the estimates are provided to the Revenue Secretary who collates the numbers across various sources and comes up with the final size of expected revenue inflow into the government treasury. Budget Preparation – What goes into getting the numbers right? Once the estimates of revenue and expenditure are available, the process to set the numbers within the broad ambit of the economic and financial goals of the country begins. The income and expense estimates are matched to assess the level of the shortfall in revenue to meet the requirements. The economic advisors of the government then sit together to assess the extent and form of the borrowings that the government should undertake to meet the shortfall. This assessment is dependent on the level of deficit that the economy can withstand. Internal borrowings are predominantly dependent on this deficit goal that the government sets for itself. External borrowing figures are known by the time of budget preparations and these come in form of bilateral and multilateral assistances from other countries. The government could keep aside a part of the shortfall to be filled in by an issue of treasury bills during the year. However, once these numbers are matched, more often than not there is still a considerable gap between the inflow and outflow of funds from the treasury. It is at this point in time where the top leadership of Finance Ministry and other concerned ministries sit together to ponder on possibilities of revising specific tax rates. Multiple compulsions including political and strategic come into picture during these meetings. The government wants to ensure that incentives for growth and investment are not hampered because of such revisions. If required, the government may also tweak the expenditure items to reduce the gap. Due to the political sensitivities involved in reducing subsidies, nonplan expenditure of the government is inflexible about changing it and it is the plan expenditures which get axed after preemption have already been made for nonplan expenditure. Once all the adjustments are done and final numbers arrived at to settle the gaps and fill in the shortfalls, Finance Ministry starts finalizing the draft of the budget. The budget division collates all the figures and data and begins preparing the budget documents. The National Informatics Center (NIC) lends a hand in managing all the data which nowadays is maintained in electronic format. As the documents begin reaching their finalization stage, draft versions are presented to the finance minister for his review. At this stage, the minister goes through each proposal in details and makes modifications if warranted. The minister also consults the Prime Minister and takes his input on the budget proposals. Sometime during this phase, the finance minister also briefs the entire Union Cabinet about the broad direction of the budget and some high-level specifications regarding various proposals and schemes. Any outstanding conflicts between ministries and departments are also sorted out at this stage. Once an in-principle approval of the Cabinet and Prime Minister is obtained, Finance Minister gives a final go-ahead for budget finalization. Printing of Budget – How to get the budget printed securely? Once the draft of the budget is finalized, the ministry begins the mammoth task of printing hundreds of copies of the budget documents. A copy needs to be provided to each parliamentarian on the day of budget speech and hence the number almost touches over 1000. The process of printing generally starts in the first or second week of February. A dedicated press is established for such a huge task which is critical from secrecy point of view. Each provision of the budget could have a far-reaching effect and any leakage could lead to individuals or organizations making windfall trading profits. The press is situated in the basement of the North Block, one of the wings of the Secretariat Building of Union Government. The area which is usually a high-security zone is further fortified to ensure that budget printing is undertaken in most secure and quarantined premises. The security parameters for something that is under the radar of most powerful entities do not come easy. The highest level of provisions is made to ensure that no word of the budget reaches those not authorized to see it. High-tech tapping devices, an army of security personnel, sophisticated surveillance gadgetry, digital deterrents, electronic sweeping devices and jammers, huge scanners are all pressed into service to provide the tightest security possible. Several officials and staff are quarantined to the North Block basement since the start of the printing process. These include personnel from Finance Ministry and four other ministries, legal experts, technicians for handling the press, and proof readers. No outside contact is allowed for these people for over 10 days of their quarantine period. A special contact number is provided to their relatives to send out a message in case of an emergency. A dedicated team of doctors is identified to attend medical requirements of members of this team. Only under a major medical situation, personnel would be allowed to be taken out of the building. Special arrangements for the food and lodging are made for the officials. The indoor canteen prepares meals and provides an uninterrupted supply of tea and coffee. The entire quarantine of the official starts with a traditional “halwa” ceremony as part of which a special sweet dish is prepared and served in North Block. This officially marks the beginning of budget printing and lock-in of over 100 officials into the basement of North Block. he entire North Block is set up as an electronic cocoon. No one is allowed to carry a communication device into the basement and special jammers are used to restrict network signals. Even the finance ministry is made out of bounds for visitors or journalist who may usually have unfettered access to the premises. All budget documents are prepared on computers which have been segregated from the network. On the night when the data in the computer, to which nobody except the finance secretary has access, is transferred to CDs to send them for printing. IB, CBDT, and Central Board of Excise and Customs officials stand in front of the computer and sign the list of each file of the confidential papers that is copied on to the CDs. TA special telephone exchange is set up to monitor all communication frequencies and landlines within North Block (including those of bureaucrats) to identify any chatter about the budget. Even internet and email facility are restricted to computers of the ministry. Sweeping devices are used to clear out the premises where budget related activities are undertaken. These devices and huge X-Ray scanner machines are also installed at all entries to restrict any listening devices into North Block and prevent smuggling of budget documents out of it. Intelligence Bureau (IB) assumes charge of the surveillance of the premises and the Bureau Director himself monitors and examines the security provisions. An officer of the rank of joint Director heads the IB team comprising of over 24 officers of Deputy Superintendent of Police rank at the North Block. Surprise drills are conducted to take out any potential loop holes in the setup. Special alertness is required post third week of February when the most secret portion of the budget – personal taxation – is provided for printing. Any slip on part of IB sleuths if detected can lead to over two-year suspension of the entire team. IB also asks Delhi Police to provide a higher category of security to the Finance Secretary as he is one person in the know of all the budget provisions and access to all documents, and hence the desired target. His criticality is obvious from the fact that IB chief is in contact with him on daily basis. Once printed, sealed trunks of the budget copies are transferred to the Parliament in the dead of night at an undisclosed time and through an undisclosed route. Budget Presentation in Parliament – Who stamps final approval? Edit - Jan 24, 2017 : From the year 2017, Government of India has clubbed the Railway Budget into the General Budget and has decided to make the budget speech on 1st February. Kindly read accordingly. At the end of the entire process, the finance minister seeks the permission of the President of India to allow him to present the budget in Parliament. Technically the budget is presented in Lok Sabha on a day specified by the President. Conventionally, the budget has been presented in Lok Sabha by the finance minister on the last working day of the month of February every year. The finance minister makes a speech while introducing the budget. The Budget speech provides the direction in which the government wishes to move in the coming financial year, the growth targets and the major thrust areas. The Finance Minister spells the broad tax policy measures in his speech. Detailed provisions and numbers are contained in separate documents which follow the speech. The annual financial statement is laid on the table of Rajya Sabha after the finance minister concludes his budget speech in Lok Sabha. The budget documents are made available to the members of Parliament after the finance bill has been introduced in Lok Sabha, and the House has been adjourned for the day. Once the budget is presented in the house, the provisions are debated for about 2-3 days, after a short interval for a few days. The Finance Minister responds to the debate and tries to address concerns of various parliamentarians. Post this debate various standing committees discuss the demand of grants proposed in the budget. Meanwhile, the budget is also forwarded to Rajya Sabha for comments which are not binding on Lok Sabha. Though the new financial year kicks in on April 1st and hence budget should become effective from that date, various delays invariably crop in and the final budget gets approved only by end of May. Executive generally gets the Parliament to approve a temporary vote on account to accommodate government expenditures in the interim. With the approval and notification of new budget being effective, the official process of budget preparation concludes and the entire Finance Ministry team takes a short breath of relief before embarking on preparations for the next cycle. Was this a too lengthy of an article? Were you kept involved or did you lose track? Did you gain something or the result is a loss of 20 precious minutes? Want to praise the author or curse him? Have feedback or criticism? Pour it all out in the comments, which I assure you, are welcome in all their form and manner.